My Little Homestead has a new video series that documents each step of construction of Shea’s new earthbag bedroom. At the beginning of this particular episode they explain their favorite soil cement floor method. 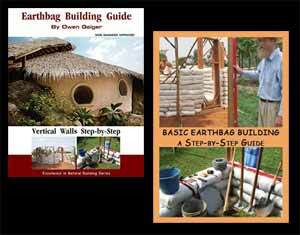 They use this method as a subfloor or base for an earth floor (what they call cob). I think with practice and refinement it could create a passable finished floor with a bit of touchup later. Here’s the basic process: 1. Till the floor with a mini rototiller; 2. Moisten the soil with a garden hose and till the soil again; 3. Add 1/2” cement on the surface. They distribute the cement with coffee cans. 4. Moisten the floor and rototill. 5. Add more cement then repeat step 4 one more time. 5. Start at the center and gradually start tamping and leveling the floor. 6. Keep floor moist for several days so it dries and hardens slowly. Related: Eleven Earth Floor Methods Check out the different methods and I think you’ll see how this My Little Homestead method compares very favorably. My Dirt Cheap Housing Instructable explains how you can save tens of thousands of dollars building your own home using techniques such as earth floors. I just started watching this channel this week – they have a fantastic series on earth bag building. While most rooms are round, they look at different roofing, flooring and plastering styles, as well as have a good series on how to build underground. It’s a great channel and really fun to watch. I’m grateful to all the sites such as My Little Homestead that experiment, document their projects and share with others. I love how they’re building one small building at a time so they don’t get overwhelmed. Many people tackle overly large projects and then get bogged down. Start small!